Fiona Sheldon, Andrew Staley and I recently returned from another successful trip, to see the South Sudanese refugees living in Uganda, where we witnessed significant progress made within the projects supported by CRESS. 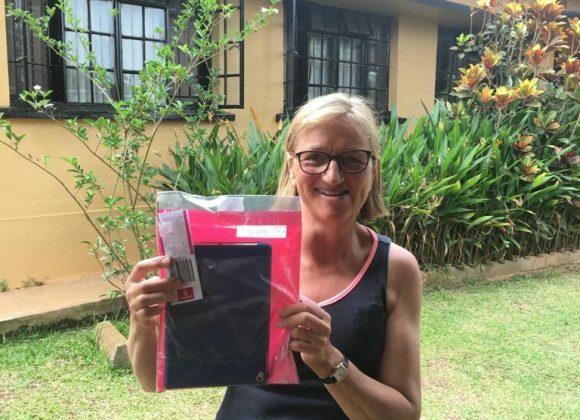 Whilst visiting the CRESS office in the Diocese of Liwolo, we were greeted with great excitement in response to the gifts we distributed, from necessities such as clothes to items to help the community thrive such as printer cartridges and even iPads! During our trip, we managed to visit 10 of the 15 CRESS agricultural groups. The funds generously supplied have enabled 200 people to be trained. Each group had impressively managed to provide more varied nutritious food for their families and earn money from the surplus, which will be used in part to reinvest in the purchase of seeds and tools, an important step in the road to self-sufficiency. At the clinic in Mijale, Edward Mika and his team reported an increase in the output and range of medical care provided. We were delighted to hear that the clinic has treated 5,727 patients this year to date and is making a significant contribution to improving the health of the community in the area. We then travelled on to Moyo, to meet the team and families of Bishop Emmanuel’s Diocese of Kajo Keji. An additional detour to Gobor proved emotional, as Pastor Eli Mawa and his community have created a beautiful church and provided a nursery school for 183 children, aged under five. Finally, as we left, we were joined by a cacophony of children whooping, running and waving. A joyous end to a wonderful and important trip. Previous LinkNew Uniforms for Clinic StaffNext LinkJackie is back in the clinic!